Longtime readers of my blog know that I LOVE time travel stories! I have raved here before about novels like The Time Traveler's Wife, Outlander, To Say Nothing of the Dog, and one of my all-time favorite books ever, Replay (not technically time travel but similar). 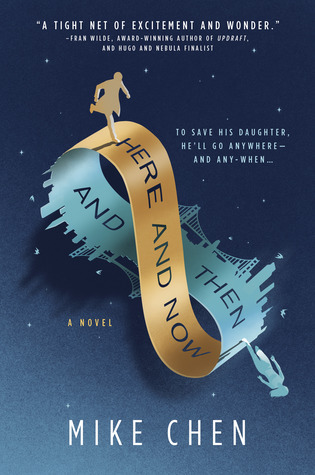 So, when I was perusing the list of possible February review books for Shelf Awareness and read about Here and Now and Then by Mike Chen, I got pretty excited. I e-mailed my editor and told him this book sounded like it had been written just for me (and probably used way too many exclamation points), and he sent me a copy. I was right - I loved this book! It's about a guy from 2142 who works as a time travel cop. He goes back to 1996 and gets stuck there. Eventually, he marries and has a daughter and is living happily there, when - surprise! His old team finally comes for him. They whisk him back to his own time, where his fiance is waiting. By now, though, his family back in the early 21st century feels more real to him than his life in his own time. When he finds out his daughter is in trouble in the past, he pledges to find a way to help her. This novel has everything that I love about time travel plots: it's twisty, thoughtful and thought-provoking, suspenseful, and even heartwarming (and heartbreaking), combining the warmth of family drama with the action of a thriller. My review was published at Shelf Awareness today so check it out. There's an audiobook version! It sounds great - listen to a sample here. Or you can order Here and Now and Then from Book Depository, with free shipping worldwide. I am not a big time travel reader, but I love the enthusiasm I hear in your review! What I like best about time travel plots, Helen, is the way they make you THINK - about cause and effects, history, and more - I think the twistiness! I saw this book a few days ago and added it to my tbr list. There's a little time traveler hole in my heart now that the TV show Travelers is over, and I think this might help! Have you already watched season 3 of Travelers, Lindsey? I thought it just came out recently - we haven't finished it yet. I love that show, too!! And Timeless just ended, too - did you watch that one? We enjoyed that one, too, and were glad when it was cancelled that they made a 2-hour special episode to wrap it all up instead of just leaving us hanging!